This procedure is only to be used with the temporary tire repair kit. The tire inflator and temporary repair sealant are used on vehicles without a spare tire. The temporary repair sealant used to repair the tire must be removed before the tire is permanently repaired. The temporary repair sealant (once used or past the expiration date) is considered hazardous waste, and must be disposed of in an environmentally safe manner (such as used engine oil and coolant). Check with your local regulations for proper disposal. The expiration date of the temporary repair sealant is printed on the container. Do not dispose of a tire still filled with sealant. Place the wheel and tire assembly upright with the tire valve hole at the 6 o’clock position. Remove the valve stem nut (A). Push the tire pressure sensor (C) into the wheel, down into the tire. Be careful not to spill the tire sealant from the valve stem hole (D). Check the nut and the washer, if they have deterioration or damage, replace them with new ones during reassembly. Use a commercially available squeeze bottle (A), a siphon gun, or a hand vacuum tool with a proper tube to remove the tire sealant. 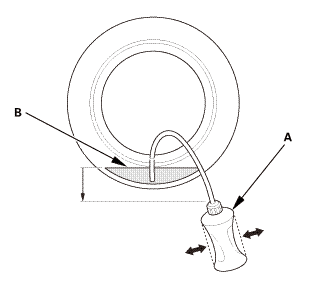 Insert the tube into the tire through the valve stem hole, and stick it down until the end of the tube is immersed into the sealant (B). NOTE: If using the bottle with the tube, set the bottle in a lower position than the tire and squeeze the bottle to siphon the tire sealant into the bottle. Completely seal and dispose of the bottle containing the tire sealant in the proper manner for hazardous waste. Check with your local regulations. 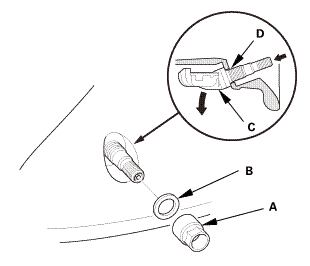 Remove the tire pressure sensor (A) and the grommet (B) from inside the tire. Completely rinse the tire pressure sensor with cold water to remove the tire sealant. NOTE: Do not use any soap or cleaner. Use cold water only. Make sure the tire sealant does not stick to the sensor. 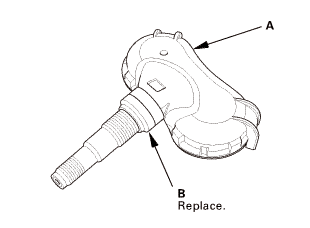 If the sealant has dried onto the tire pressure sensor, then the sensor must be replaced. If you are repairing the tire for reuse, completely wipe out the inside of the tire, fix the flat, and reinstall the tire pressure sensor with a new grommet. Wipe the fluid sealant completely so that the beaded edge of the tire and the mating portion of the wheel rim and the bead are cleared. The damaged portion such as punctures may be filled with the fluid sealant, depending on the extent of the damage. Test-drive the vehicle at 28 mph (45 km/h) or more for at least 3 minutes. Make sure the low tire pressure indicator or the low tire pressure/TPMS indicator does not come on. Make sure the low tire pressure indicator or the low tire pressure/TPMS indicator turns on. If the low tire pressure indicator or the low tire pressure/TPMS indicator does not come on, replace the tire pressure sensor. Inflated the tire to the specified tire pressure listed on the doorjamb label.